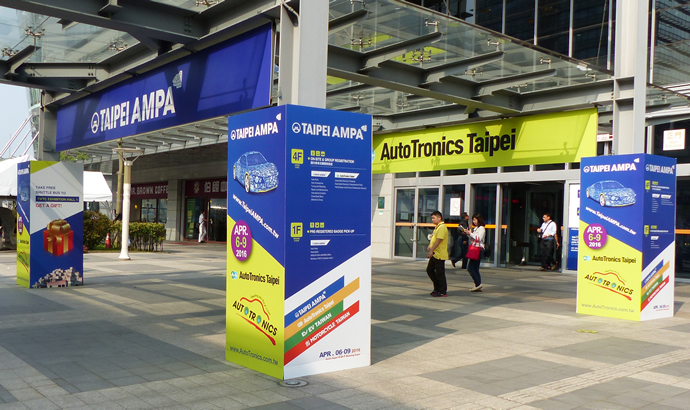 Steve Rogerson reports from last month’s Autotronics automotive electronics show in Taipei. Taiwan watches. It’s what it does best. For years in the consumer electronics space, it has watched what everyone else has been doing and then done the same, but better, cheaper or often both. This ability, which has made it one of the high-tech hubs of the world, is now moving full scale into the automotive space. This is not a new market for the country. Companies there have been making automotive parts (mostly for the after market but sometimes for the car manufacturers), for decades. However, what has changed is that their skills in computing have now been added to the watching brief of the automotive sector. A good example stems from BMW’s concept design at this year’s Consumer Electronics Show in Las Vegas, where it was demonstrating the idea of a standard rearview mirror replaced by an LED display showing the full behind range from pillar A to pillar A. By the time last month’s Autotronics show opened in Taipei, a consortium of three companies had already put this into practice. Link-Eyel, Photic Electronics and SarmoTek had combined their technologies to turn the mirrorless concept into a physical product, called A2A, that provides the driver with a 270 degree rear view from a screen placed where the normal rearview mirror usually sits. It is scheduled for release in June. The Taiwanese companies also like bandwagons because they usually mean high volume sales areas in which many of them can compete and still profit. This was clearly visible at the show with large numbers making tyre pressure monitoring systems (TPMS), instrument clusters, head-up displays and LED lights. This was evidenced at the event’s Innovation Awards, in which TPMS related products took three awards, and HUD and LED lighting systems were also well represented. The country is also trying out smart city concepts linked with intelligent transport systems. In Hsinchu in northern Taiwan, for example, there is a vehicle-to-infrastructure trial that is feeding back road traffic information to vehicles. This started last year and if the trial succeeds the plan is to extend the technology to highways and then general roads. In the capital Taipei, there is a project to have special buses connecting the main tourist sites with intelligent traffic information. And the city’s smart LED street light project is nearing completion. This will allow the automatic reporting of street light failures as well as having scheduling and dimming features to provide energy savings. The growth in the number of car manufacturers in south east Asia, especially China, is providing a change of focus for Taiwan. Whereas once the after market was seen as its main outlet for automotive parts, it is now making inroads into OEM plans. However, some Taiwanese companies still see the after market as the core business. Take Depo Auto Parts, for example, which specialises in LED headlight and tail lights. Only three percent of its business is from OEMs, with the rest in the after market led by replacement parts following car accidents. Statistics from the Taiwan Transportation Vehicle Manufacturers Association still show the US as by far the biggest export market for automotive components, accounting for 44.4% of sales, followed by Japan at 6.8%. China is just 5.4%. Interestingly though, Iran, lying 25th with just 0.5%, was singled out at the opening ceremony by the Taiwan government’s representative, Shih-Chao Cho, Deputy Minister at the Ministry of Economic Affairs. He said the lifting of sanctions held promise for the industry. Suppliers to the consumer electronics market are facing a tough time with shrinking margins and faster design to market cycles, and thus many Taiwanese companies have chosen to take their expertise to the more profitable automotive sector. She said that because of this, Infineon was expanding its automotive business in the country. This was the first time it had exhibited at Autotronics. He said even the traditional companies that made notebooks and tablets were looking at automotive electronics. Taiwan has always been an aggressive exporter. Its history in the electronics and computing sectors speaks for itself. Thus it is no surprise to see it moving those skills into the automotive industry following the growth in electronics within vehicles. And it is always looking for new opportunities, as witnessed by the trade delegation that headed for Iran as soon as the sanctions were lifted. With much growth in automotive manufacturing being on its doorstep in China and the rest of south east Asia, it is ideally placed to exploit the move towards connected vehicles.